NEVERTHELESS! Call me a cockeyed optimist, but I think the fact that I'm still a bit of a Kombucha newbie is actually a plus. So many how-to blog posts are crammed full of intimidating extraneous details that you get scared off and never even give the thing a go. If there's one lesson I've learned repeatedly this year it's that things are almost never as hard as people make them out to be. And if I can do it you most certainly can too. So here y'are, a distilled guide to making your own kickass kombucha. Simple yet effective. Like gunpowder, or an Iggy Azalea song. Also, even though I'm a newbie, I've held off uploading this post while I experimented with various kombucha brews, aiming to achieve maximum fizz, good flavour combos, and to acquire enough general know-how to feel competent in writing a Kombucha brewing guide. I think I've made it, I'm ready. Come friends, join me and together we can wade through the murky and delicious quagmire of kombucha brewing! Ok, first thing's first. Kombucha is fermented tea! You make it by combining sugar and strong black tea (although you can also experiment with green teas and the like), in a big jar with something called a SCOBY. The Scoby is full of yeast and good bacteria. The yeasts chow down on the sugar (glucose), breaking it down into different sugars (sucrose and fructose). These then ferment, producing alcohol and carbon dioxide (which is what gives the fizz), and the bacteria convert most of that alcohol into acetic acid, giving Kombucha its distinctive sour taste (like yummy, fizzy, tangy apple juice). Despite alcohol being produced in the process, Kombucha is barely alcoholic (from 0.5% - 2%, so much less than a beer). Scoby is a weird sounding word for a weird alien lookin' thing. Actually, its not really even a word - 'SCOBY' is an acronym for Symbiotic Culture Of Bacteria and Yeast. It looks like a gloopy jellyfish and it floats on top of your Kombucha, converting the sugars in the mix into delicious tangy flavours and fizz. Often people get given Scoby babies from friends who are already brewing their own Kombucha. Because Scobys continue to grow and renew themselves, once you have a big, established Scoby it's easy to remove a bit and share the fermentation love around. My friend Audrey gave me a bit from her Scoby, it looked like a baby jellyfish in a jar. If you dont have any friends with their own Scobys, the next easiest thing to do is buy a bottle of raw, unflavoured kombucha from the shops. Your best bet is to get a bottle where you can already see little bits floating around - they're the beginnings of baby Scobys. Full disclosure: I tried this. I bought a bottle of kombucha, poured it into a big jar, added super sweet tea and after four days...I had a big bottle of sweet tea with a thin film of fuzzy grey mould on top. Not ideal. Speaking of which, if you ever see anything that looks fuzzy and mouldy in your Kombucha, do NOT drink it. Chuck it and start again! Healthy Scobys look funny and rubbery and weird, but they should never look fuzzy. Check regularly for fuzz/mould and make sure you don't drink any Kombucha if you see mouldy fuzz. If things are going to plan, your Kombucha should smell fresh and kinda vinegar-y, like the shop bought stuff does. If it smells really weird, like old socks, cheese, or like something has gone off - chuck it. You want to play it safe here (if in doubt, throw it out etc. ), but in my experience the difference between my first mouldy batch and my second successful batch was really obvious. If you want to be extra sure that your Kombucha is safe to drink, you can always test the pH of the Kombucha with an inexpensive at-home pH testing kit. You want your Kombucha to have a pH of 4.6 or lower. This indicates that it's safe to drink, as it contains enough acetic acid to inhibit the growth of any bad bacteria (although at the moment I'm relying on the altogether less safety conscious method 'just drink it and see'...so far so good!). 1 cup of sugar for every 4L of strong black tea. I started off small with mine because I didn't want to overwhelm the baby Scoby. So for my first batch I used 1L of water, 4 teabags and 1/4 cup of castor sugar. I kept this ratio the same every time, but gradually increased the amount of tea I was adding in (e.g., for the second brew I used 2L water, 8 teabags and 1/2 cup of castor sugar). To make the sweet tea, I just get a big measuring jug, chuck in the teabags and sugar, fill it with the water and then let it sit and steep for a few hours. Once it's cooled to room temperature (and the sugar has dissolved) I fish out the teabags, and it's ready to go. For the first brew, I poured the sweet tea into a big jar containing my baby Scoby, and placed a cotton tea towel on top, held tight with a rubber band (you want to use fabric for the lid so the Scoby can breathe). I let it sit for about a week, while the Scoby gradually grew in size. Then I removed only 500ml of the kombucha (and drank it out of sheer curiosity), leaving most of the brew in the jar with the scoby. To this I added another 2L of sweet tea, and left it to ferment for another 4-5 days. I've pretty much been repeating this process ever since. Every time I take out some brewed Kombucha, I add in more sweet black tea. If you just want plain Kombucha that's all you have to do, but if you wanna spiff your Kombucha up (i.e., make it extra fizzy or add in yummy flavours), you'll want to do a secondary ferment. Dun dun dun! This is where it gets exciting! Once my big batch of Kombucha is ready (i.e., tasting a bit sour and a little fizzy) I decant it into smaller bottles. I use bottles that have thick glass, a thin neck, and a rubber seal (or a cork). I add some more castor sugar to the decanted Kombucha (this helps keep the fermentation process going, which will result in a fizzier Kombucha). I also add in whatever flavour combos I've decided to try (please get whacky and creative with these and send me your favourite suggestions!). If you want super bubbly Kombucha, that's going to come down to 1) the amount of sugar you add, 2) the temperature of the room the Kombucha is in, and 3) the amount of time you leave it to ferment. More sugar enables more fermentation, which means the production of more carbon dioxide, giving you fizzier Kombucha (I've been adding between 1 tsp and 1 Tbsp). If you taste your Kombucha after a few days and it tastes sour (not sweet), but still isn't fizzy, that's a sign that the yeasts have eaten up all the sugar you added. Add a bit more to encourage more fizz. Kombucha ferments faster at higher temperatures. So you could find that your Kombucha gets really fizzy after only a few days in summer, while it might take longer in winter. Make sure you let it ferment in a dark spot away from sunlight, but don't worry if it takes a little longer to get fizzy during cold weather. Just be patient and give it time if you're after super-fizz. My second batch of ginger and lemon Kombucha looked like it was going to stay flat forever, but I added a little more sugar and I waited then - POP! Super fizzy, super tasty, all good! So, if your Kombucha isn't fizzy yet it might just need a bit more time or a sprinkling of sugar. If, on the other hand, your Kombucha is fermenting quickly, you might end up popping a few corks as the pressure builds inside the bottles. Because of this, it's a good idea to open the bottles every few days to make sure that the pressure hasn't built up too cork-popping-bottle-exploding levels. 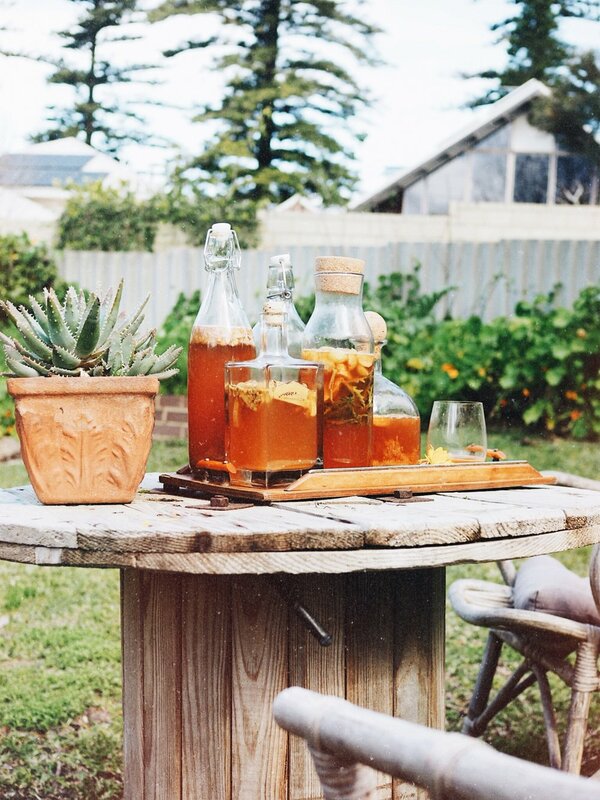 Once you're happy with the fizziness and flavour of your kombucha - drink away! The longer you leave it to ferment the more sour and bubbly it will get, so the amount of time you leave it for really depends on personal preference. I taste mine every few days and like to drink it when it's nice and fizzy. Is Kombucha actually good for you? Jury's out on this one! There is rampant speculation that the bacteria in Kombucha might confer the same benefits to your gut microbiome as things like Kimchi, yoghurt and probiotics. This hasn't been reliably confirmed in human models yet, although some lab tests (think Petri dishes and cell cultures) do suggest that Kombucha might have antimicrobial, anti-cancer and anti-diabetic properties. What we do know with more confidence is that because Kombucha is made from black tea, it likely carries all the same benefits that drinking black tea is reputed to carry (it contains heaps of antioxidants, which help repair cell damage and may improve heart health and cholesterol levels and reduce blood pressure). 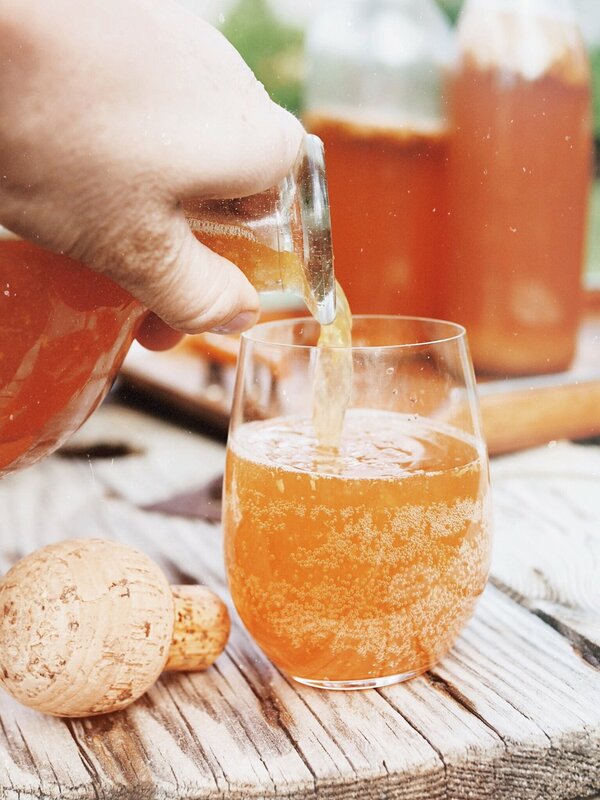 Whether it's a miracle cure or just something yummy and fizzy to drink, properly brewed Kombucha is pretty harmless, so there's really nothing to lose in making yourself a batch. It also contains caffeine so if you're looking for an alternative to your morning coffee, look no further! Is homemade Kombucha worth your time? Last, perhaps the most important question. Is it actually worth it to make your own Kombucha. My response is a resounding YES! This is one of those instances where people are ROBBING YOU BLIND MAN. What's a bottle of Kombucha cost at the shops these days? $6 or so, right? Well you can make it for BUGGER ALL, and once you get in the swing of things it takes next to no time. 1. Taste a little of the Kombucha base (from the big jar containing the Scoby). If it's sour (meaning the yeasts have eaten all the sugars), decant about half into bottles, add the sugar and kooky flavour combos and set those aside). 2. Brew the kettle, put the sugar and teabags in a big jug and fill with water then set aside to dissolve, infuse and cool to room temperature. Pour into the main Kombucha jar. It took me a little more time at the start, but after a bit of practice it really takes basically no time to have a batch always on the go. And now I'm more confident that I'm not going to accidentally kill the Scoby (or myself) I'm really enjoying trying out weird random flavours! If you have any of your own flavour combos to recommend please leave them in the comments below! Or if you have any tried and tested trick and tips to recommend, please let me know. Last, I hope I've answered everything, but give me a shout if you have any lingering questions and I'll do my best to answer them! Happy brewing one and all!